Cottage on Fox Hollow: News To Me. . . 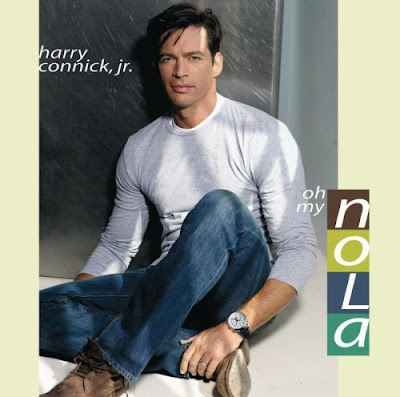 I didn't know this until last night at the dinner table, but it seems my 4 year old son knows Harry Connick, Jr. Yes, THE Harry Connick, Jr. It all started simply enough. I asked the kids if they'd like Frank Sinatra, HCJ, Michael Buble, etc. for dinner music. (It was just me and the kiddos eating pot pies, to put it into perspective.) SuperGirl opted for no music this time, while SuperBoy asked for HCJ. He then starts into this story of how HCJ was at my in-laws a couple of years ago (when he was 2) eating dinner. Superboy sat between HCJ and Papaw. After numerous questions, we find out that HCJ lives in California, picked SuperBoy up and drove him to my in-laws. SuperBoy also mentioned he didn't have to use his car seat because he was big enough and didn't need it. SuperGirl asked SuperBoy to describe what HCJ looks like and he said he looks like Michael Buble. SuperGirl then asked what Michael Buble looks like, to which SuperBoy replied "Harry Connick, Jr." Turns out HCJ has black and blue hair and also spent the night at the in-laws. Seems SuperBoy, HCJ and the in-laws all slept in the family bed together, with HCJ in the middle. I asked if SuperDad, SuperGirl or I were there and he said no and he didn't miss us. Granted, he's never stayed at my in-laws without us before. ??? And he appears to totally believe this story. Seriously. On another note, he's voting for one of my husband's friends for President this year. He rarely even sees him. We have no idea why, but he said he would vote for Dale. SuperDad just tells him, "I'm sure he'd apreciate your support." I love the imagination, but geez, it's kind of scary, too. HCJ lives in California? Oh, wait... Well, the kid had me going until the whole bed sharin' thing. My oldest daughter has an imagination like that. I love HCJ :) I just want to know why Superboy didn't invite me to the sleepover. I :heart HCJ. He rocks. He secretly married me instead of Jill wasser name the model. Yup yup. Okay, SuperBoy is super precious! I'm just a gigglin', down here!!! I live in the same state as HC,J (well, not Cali) and I STILL haven't seen him! I'm too jealous!!! He didn't even miss y'all, huh? That boy is too cute!